iOS and Tablet AppsvJournal: vJournal is a simple, free iOS app that allows your to create dated journal entries that are then uploaded to an Evernote notebook called "My Journal." It is extremely simple to use. Each entry is automatically dated. When you are finished typing an entry, simply click the upload button. You can also insert photos in your entries as well, which means vJournal also gives you the ability to create a photo journal. From the perspective of a school leader, vJournal is an excellent app for keeping various log entries and observational data. Check out vJournal in the iTunes store here. vJournal Interface Penultimate: Penultimate is a free handwritten note-taking app for the iOS device. There are times when all you need is a place to jot info and, if you're like me, you don't even carry a pen or paper any more. 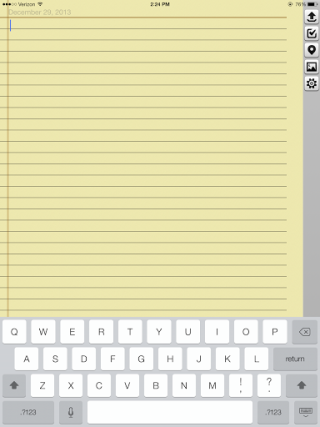 Penultimate is a handwriting app for the iPad that syncs to your Evernote account. You can also insert photos from your Camera Roll or take a picture and insert it into your handwritten notes. Penultimate's features add even more functionality to Evernote. Check out Penultimate here on the Evernote Penultimate Web Site. Penultimate Interface Skitch: Skitch is a graphics app for the iOS or Android device that allows users to communicate graphically. You can take a photo and use graphical tools to mark that photo up and then send it to others. For the school leader or educator, it is excellent way to make communication more visual. Skitch is also available for download to a Windows PC. For more information about Skitch, check out the Skitch Evernote Web Page here. Skitch Interface Boxer: Boxer is an email app for the tablet that offers users a whole range of features. The one feature that is of interest to Evernote users is that it allows you to send email messages to whichever Evernote notebook you select. This integrates your email into your Evernote application, adding still another function to your Evernote capabilities. Check out Boxer for email in the iTunes store here. Clearly Interface Evernote Web Clipper: This Chrome extension also gives users many, many more features that expand Evernote's functionality. Users of this extension can choose how they want the Web content to be "clipped" and saved. They can save it into the Evernote notebook of choice as an article, simplified article, full page, bookmark, or screenshot. Users can also highlight text, insert arrows, and type text notes. Users can also share the Web article through Facebook, Twitter, LinkedIn, or email. This Chrome extension is just another powerful way to extend your use of Evernote. Check out the Evernote Web Clipper in the Chrome Store here.